Scientists have long held that modern humans originated in Africa because that's where they've found the oldest bones. Geneticists have come to the same conclusion by looking at Africa's vast genetic diversity, which could only have arisen as DNA mutated over millennia. 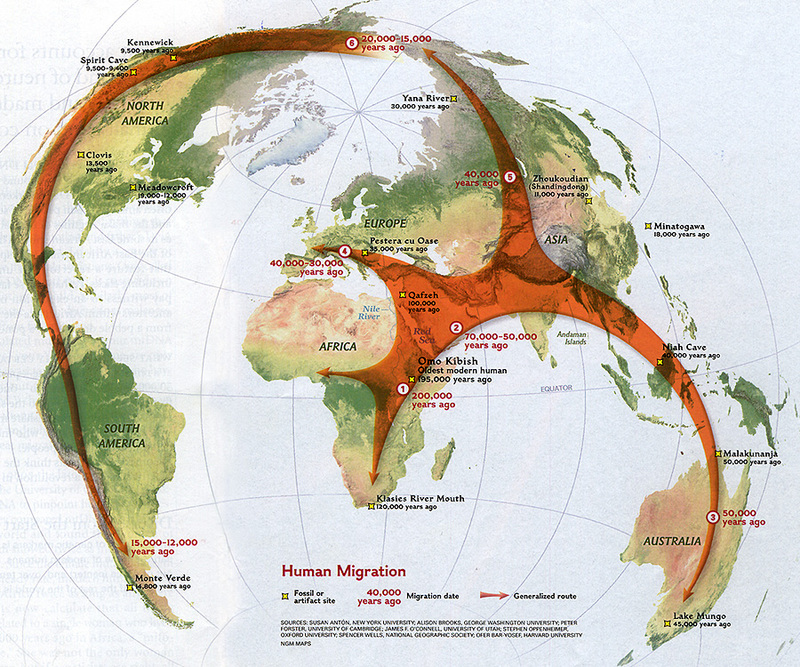 There's less consensus about the routes our ancestors took in their journey out of Africa and around the planet. Early migrations stalled but left behind evidence such as a human skull (above) from 92,000 years ago at Qafzeh, Israel. Those people may have taken a northern route through the Nile Valley into the Middle East. But other emigrants who left Africa tens of thousands of years later could also have taken a different route: across the southern end of the Red Sea. Scientists say these more recent wanderers gave rise to the 5.5 billion humans living outside Africa today. "I think the broad human prehistoric framework is in place," says geneticist Peter Forster of the McDonald Institute for Archaeological Research in Cambridge, England, "and we are now fitting in the details." Genetic data show that a small group of modern humans left Africa for good 70,000 to 50,000 years ago and eventually replaced all earlier types of humans, such as Neandertals. All non-Africans are the descendants of these travelers, who may have migrated around the top of the Red Sea or across its narrow southern opening. Discoveries at two ancient sites - artifacts from Malakunanja and fossils from Lake Mungo - indicate that modern humans followed a coastal route along southern Asia and reached Australia nearly 50,000 years ago. Their descendants, Australian Aborigines, remained genetically isolated on that island continent until recently. Around 40,000 years ago, humans pushed into Central Asia and arrived on the grassy steppes north of the Himalaya. At the same time, they traveled through Southeast Asia and China, eventually reaching Japan and Siberia. Genetic clues indicate that humans in northern Asia eventually migrated to the Americas.